An enticing selection of vegetarian cheeses. 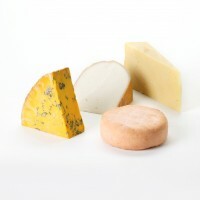 A collection of delicious cheeses made exclusively with vegetarian rennet. This collection fits perfectly in one of our stylish small gift boxes, why not add one to your order for a complete gift experience? Shropshire Blue 250g (pasteurised, vegetarian), Rachel 250g (thermised, vegetarian), Fooseway Fleece 250g (pasteurised, vegetarian) and Golden Cenarth 200g (pasteurised, vegetarian).